While this particular dress was beyond my reach, I put it in my inspiration file. A little later I came across this fabric and immediately thought of the dress. I wanted to make a similar style dress and was keeping my eye out for suitable patterns. Then I realised I had an excellent candidate already in my stash. 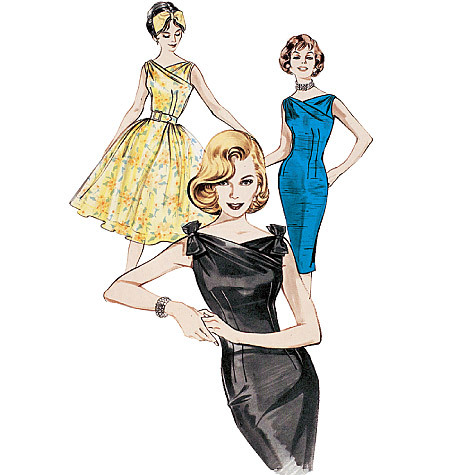 Remember Butterick B6582? I made the straight skirted "screen sirens" version last year. The pattern includes a full skirted version as well. Since I'm already familiar with the pattern and the bodice fit quite well with minimal alterations, it seems a good choice for my next frock project. After the Crepe dress that needed so many muslin changes and the fabric that was a nightmare to work with, I'm looking forward to something a bit more straightforward. And I have strong motivation to make this dress. My best friend is getting married in May and I will be her maid of honour. It's a nice simple ceremony so I've been spared the usual horror of bridal party wear. 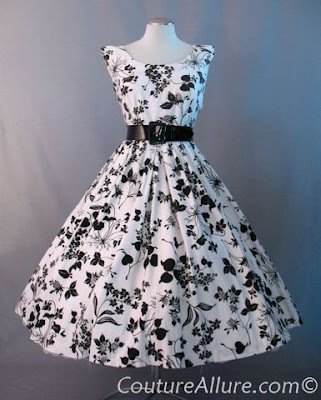 I'd like to have a new dress to wear and having a rough idea of what the bride will be wearing, I think a full skirted vintage style frock would be quite appropriate. And it will give me a chance to finally have something I can wear my very frilly petticoat with. I'm so excited for you! That is going to be a beautiful frock, and just the thing for bridal attendance. Beautiful fabric, and they are both great patterns!